I have some fun news today. 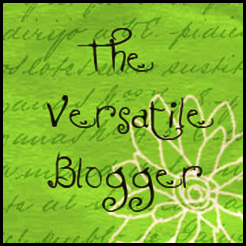 I have been nominated for the Versatile Blogger Award. Not once – but twice this week! I colour match my pegs when I hang the washing on the line. I mean I have to. My sister once pegged all my pegs in matching colours on the line and said to me “There, how’s that for your OCD?” Err, thanks. I accidentally wore my PJ pants to school in Grade 5 under my uniform. I just forgot to take them off. I spent the day in total mortification of someone finding out. You know the little frill bloomer numbers of the late 70’s? Yeah- those. I do have my nose pierced (a small gold heart). My husband payed for it on my 40th Birthday so I couldn’t chicken out. I once fell asleep at work, sitting on the toilet. In my defence it was after a 12 hour night shift. That wraps up this post for today. I still have my blogging ‘L plates’ and am trying to work out links in my posts but I think I may have mastered it. I am off to contact all the recipients of my nomination now. I promise.